Ragù di carne is the classic Italian meat sauce and, while there are many different regional versions, this one has a Tuscan spin. As with most good Italian sauces, it starts with an Italian soffritto—finely chopped carrot, celery, and onion sautéed in olive oil—that is basically the same thing as the French mirepoix. Unlike the meat sauce often made in the U.S., an authentic Italian-style ragù is mostly meat with very little tomato, but you can make your sauce with more or less liquid depending on your taste and how you intend to use it. For example, if it is part of a lasagna made with dried pasta noodles, make the sauce more liquidy, while if you're going to make a lasagna with fresh pasta sheets, keep the sauce dryer. This recipe calls for a few unorthodox ingredients that are purely optional—tamari or Japanese soy sauce, fish sauce, and Worcestershire sauce. They all add umami (a pleasant savory taste) that will punch up your recipe. 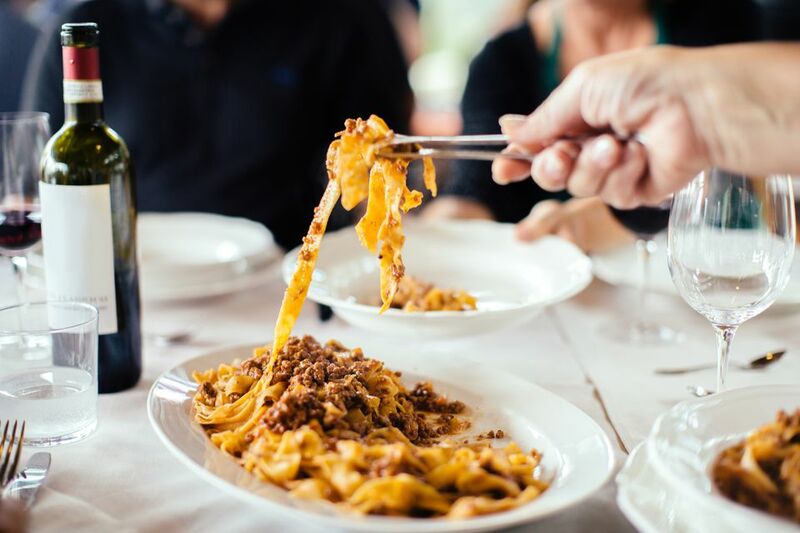 It is used in such small quantities that their individual flavors will not be detectable and they won't alter the traditional flavor profile of an Italian ragù. If you don't have these ingredients or choose to omit them, the recipe will still turn out delicious. Note: while there are multiple steps to this recipe, this ragù dish is broken down into workable categories to help you better plan for preparation and cooking. Heat the olive oil in a large, heavy-bottomed pot over medium-low heat. Sauté the onion, carrot, and celery until softened and reduced somewhat, and the onions are slightly caramelized, about 20 minutes. While you are cooking the soffritto, reconstitute the dried mushrooms: Place the dried porcini in a small bowl with enough warm water to cover and set aside for about 15 minutes. When the mushrooms are softened, drain, retaining the soaking water in a separate bowl. Chop the mushrooms finely and set aside. Add the tomato paste to the soffritto and cook until the paste thickens and darkens for about 2 minutes. Add the prosciutto and the ground pork and beef; raise the heat to brown the meat, stirring often with a wooden spoon. Add the wine and stir until most of the alcohol aroma evaporates, about 1 minute, stirring to loosen and dissolve any bits stuck to the bottom of the pot. Add the chopped porcini and tomato purée and stir well to mix. Season with salt and pepper to taste and a pinch of freshly ground nutmeg. If using, add 1 or 2 drops of Worcestershire sauce, the tamari or soy sauce, and 1 or 2 drops of the fish sauce. When your sauce is done, removing it from the heat and stir in the finely-grated lemon zest. This also sounds unorthodox, but the touch of brightness really balances out the heavy richness of the meat sauce and brings all of the other flavors together. This is one of those dishes that tastes better every time you reheat it, so make a big batch, use it as a pasta sauce for a day or two, then make a meat lasagna with it on the second or third day, and freeze any leftover sauce. (It freezes wonderfully.) If you're making a lasagna or want to have extra to freeze, then you can easily double or triple the recipe. If you can find ground veal, the sauce is even better with a mix of three kinds of meat—4 ounces ground beef, 2 ounces ground veal, and 2 ounces ground pork. Of course, this sauce is wonderful on pasta, particularly fresh tagliatelle or pappardelle, but it's also great served on top of the small square or round slices of fried polenta as an antipasto or party finger-food, or even on small rounds of bread or crostini. You also can use it to stuff fried arancini rice balls, cannelloni, or any other type of stuffed pasta shell, then top with besciamella sauce, some grated Parmigiano-Reggiano, and bake until golden.